This book was first published in 1907. It is the interesting account of the author's stay in the Isles of Aran. I've enjoyed The Aran Islands very much, not just for the beautiful description of the islands and their inhabitants around 1900, but also because it's wonderful to see how the awakening pride in Gaelic culture, Romanticism, the islands and the personality of the author come together in this book. Some years ago I saw Robert Flaherty's film 'Man of Aran' , Ireland, 1934. Don't miss the chance to see it if you happen to find it. Released on Monday, January 12, 2004 at to fellow BookCrosser in Deventer, Overijssel Netherlands. The Aran Islands are travelling to YvonneP. I did not finish it. It did not really appeal to me. It goes into descriptions but hardly into motivations. It looked too superficial to me. However through another interesting serendipity activity I am now the proud owner of a beautifully knitted white sweater from the wool of Aran sheep. It says so, on the label in the cuff. How about that! This remains a personal copy, though. No, this is not the kind of book I especially like. I didn't finish it. Sigh... it happens far too often at the moment. Anyway, the book is on its way to nrrdgrrl. yippieee! just what i needed on this bleak day, a surprise book in the mail! thanks dear. i'm very curious what it'll be like, given the mixed reviews of others. on the other hand; however much i like these people, our reading tastes are usually not the same. so this book is a real trip to the unknown. i'm just halfway through another ring book, which i will finish soon because i don't like it. that's the beauty of bookcrossing: you get to read books others recommend and if they turn out not to be what you fancy, they're gone without remorse... like i said, i really wonder in which category these islands will end up. tip for readers after me: skip the introduction, it's extensive and bloody boring. i'd been stuck in it for at least a week before i decided to switch to the main story. which i like a lot. and only now that i'm nearing the end of it, i'm beginning to be interested in a bit more about the writer and his background. if he writes about "half naked women bathing" (on the mainland), what did he see? just ankles, i presume? the word also refers to coat-like shawls. though i'm still stuck with that festive looking but very silly mind image. Released on Sunday, February 22, 2004 at controlled release in hilversum, Noord-Holland Netherlands. annet74 sent her address really swift, and the book is on it's way! Just got this from nrrdgrrl, together with a great little thing about Indonesian cooking! Thanks, I'll read it as soon as I find the time and will send it on! I didn't really have time to read it - that is to say, there were other books that I wanted to read more - so, I'm going to send this one on to Maupi! Arrived in Utrecht, thanks Plinius and Annet. Will be read asap. I repeat nrrdgrrl's tip: skip the introduction. It is very off-putting. I did leaf through it after finishing Synge's writing though and there are some interesting bits in it. I liked reading this book. It really conveys a sense of the atmosphere on the islands at the time. Occasionally it actually made me long for the remoteness and quietude described. But that's romanticizing life on the islands and skipping the harshness. Of course, some of the descriptions and analyses may seem a bit outdated today, but that's just fits in with the mentality then, I guess. Off it goes to bilbi now. I liked The Aran Islands. All the story-telling things and the hard life of the islanders. Yet, I found that Synge was sometimes a bit condescending when he talks about them. I mean that he qualifies them of "primitive" only because they lead a different life. Well at least he doesn't try to introduce "civilisation" and for that it was a nice read. Someone else already said it, if you have the posibility to watch Robert Flaherty's movie "Man of Aran" - take it!! Very interesting read. Until now I´ve only been to Inismore (the smallest island) - but after reading this (and seen Flaherty´s film), I´d love to visit the other two! Will be off to Italy as soon as possible. It's here in Florence! Thanks. Safely arrived in The Low Lands again. Having loads to read and being the last one on the raylist (for the time being), I won't start immediately. Have read the second part of the book. This is the part in which J.M. 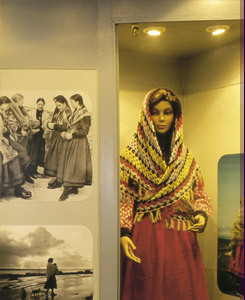 Synge describes every day life on the Aran Islands, in the period 1898-1901. To my surprise I read it in one go, notes included! 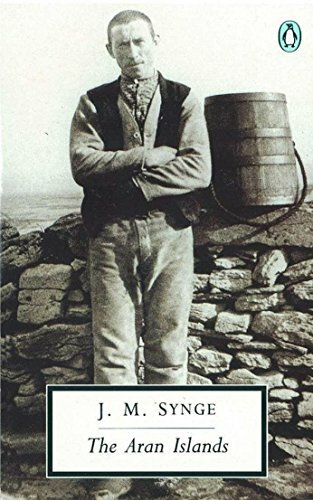 It’s not a thorough analysis of the island and its inhabitants, but it’s a simple, honest account of Synge stays there. ‘The general knowledge of time on the island depends, curiously enough, on the direction of the wind. Nearly all the cottages are built, like this one, with two doors opposite each other, the more sheltered of which lies open all day to give light to the interior. If the wind is northerly the south door is opened, and the shadow of the door-post moving across the kitchen floor indicates the hour; as soon, however, as the wind changes to the south the other door is opened, and the people, who never think of putting up a primitive dial, are at a loss. And if anybody is ringing or raying one of Synge dramas, I’m in. Will read the introduction by Tim Robinson before releasing the book again. I liked the introduction too, except for the first few pages (loads of dates). Tim Robinson writes about the person Synge and his plays. It would have been nice if Tim Robinson had printed some of the pictures Synge took in Aran. I have visited Inishturk, an island further north and Clare Island. At Inishturk (Isle of the Boar) there was a regatta race. Men in the so called ‘curachs’ racing each other. On Clare Island I saw a fisherman using a currach. 'Old' boots still used in the 21st century. Book is off to Jonkheer tomorrow. Het blijft geweldig om thuis te komen en een boek bij de post te vinden. Olifant reuze bedankt!!! Lijkt me een heel interresant boekje en ga het met plezier lezen. Another Ireland book. :) I love Ireland. I forgot, offcourse I participated in this ray, so I was suprised to find it in the pile 'for iiwi' today. Under normal circumstances I would have visited the Aran islands this summer. As for now, this book will have to do. I'm a bit drowning in ringbooks, and this one is in my possession for almost two months. So I will send it to the next one on the list. Maybe, at the end of the ray, when someone remembers me about this book, I wil participate again. Muggenlip, it's on his way to you. Dit ringboek heb ik een tijdje geleden al ontvangen, maar nog steeds niet geregistreerd (schande!). Hierbij. Ik ga het zsm lezen.